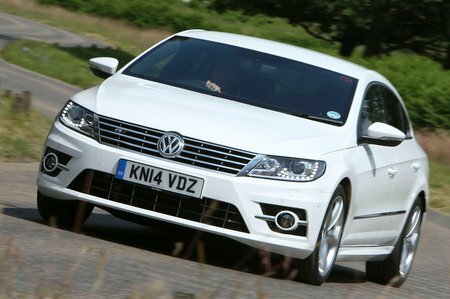 Volkswagen CC Boot Space, Size, Seats | What Car? Front seat passengers are unlikely to find they’re short of space; there’s enough width in the cabin to make sure no elbows will clash and leg room won’t be an issue, either. There’s also a decent amount of storage split between the centre console, beneath the front armrest, the door pockets and the glovebox. The cupholders are also well placed and can hold a variety of sizes. Move to the rear seats, and you’ll find there’s plenty of leg room too, even with a fairly tall driver up front. Head room isn’t as generous thanks to the low roofline, those six foot tall and over are likely to find their head brushing the ceiling. Three adults will across the rear bench but it is quite cosy. As for the boot, it’s around the same size as regular saloon rivals, with all models getting a load through feature for longer loads. A bag of golf clubs will easily fit into the load area although you might find the opening a little narrower than a conventional saloon car.